Yesterday I got an email from someone who I didn't know stating that someone I did know had passed away. Herb, the person I did know, was a head hunter or, to use the more official nomenclature, an executive recruiter. I don't know how or when we met but the how was probably based on me answering a want ad in the newspaper (just by saying a "want ad in the newspaper" is dating "the when" properly). Herb placed me in my first job in financial services in 1991. I've probably hired 20 people from him over the years with the last one just a few months ago in January. There were times when I spoke to him as frequently as daily yet there were times when we didn't speak for months. He would know the type of people I would hire and when he found one, would send him or her my way. He wouldn't bother me with people who didn't fit. I'm guessing I knew Herb for over 25 years. The odd part of our relationship was that we never met. I couldn't tell you if he was young or old, short or tall, what color his hair was (or wasn't) but I would recognize his voice on the phone as soon as he said, "Hi, guy." We sometimes exchanged holiday gifts (by mail), sometimes we didn't, and sometimes we just sent cards. We always said that we would get together for lunch or dinner some time but we never did. Something always came up and it was never a priority with everything else always going on. He often said that he "owed" me at least a lunch for all the business we did. I responded that I owed him for the high quality folks he presented and the best way to make me happy was to keep them coming. He held up his side of the bargain. Herb's death bothered me. It made me realized that some things that may not seem so important really are. I wish that I made meeting with him more of priority but did not. I will regret that every time I think of him. Then I will remember all the good stuff. The funeral was this morning. I didn't go. I didn't feel comfortable since I kept thinking about introducing myself as someone who worked with Herb for 25 years but never met him. Even so, I miss him. Last week I had to go to a nerd convention in LasVegas. I was supposed to fly out on Sunday night, go to the show Monday, Tuesday, and Wednesday, then fly back on Thursday. I packed my Garmin and running clothes with the expectation to try to continue easing back to work out mode. I also hoped to eat healthy or at least as healthy as I could. I was going to blend in with the nerds. Some people say that isn't so hard for me. Great plan, but then it got adjusted to reality and rationalization. Rather than run on Monday, I realized I didn't know how much walking I would need to do with the show. It wound up being more than I expected with the Fitbit saying I topped 20k steps. In fact, one of the wins for the week was the step report from Fitbit. Every day over 10K steps. I rationalized that all that walking was just as good as working out. I have to stop rationalizing. Work kept forgetting that I was in the pacific timezone with my day starting normally at 4:30am. I was tired and blew off most of the vendor dinners but didn't eat so healthy instead of these dinners. Vegas didn't wow me, it seemed to have more stuff run down that my previous trips and the people seemed lower class. I didn't gamble much ($20 total) and worked a lot. Even with all that, a week in Vegas resulted in no weight gained. Probably as good as I could have hoped for. Unfortunately, once I got back to civilization, I realized my motivation stayed in Vegas. The timezone impacted me coming home and I've been a lump the few days since I got home. Fitbit tells me I'm doing about 4k steps a day since I'm home. Much less than my 7-8k average. I finally unpacked my dirty clothes and realized I need get back my focus. Going for a walk later today with the goal of 10k steps. Maybe I'll even wear my Garmin and turn it into a "real" workout. That's a bet I will make. And I'll probably win. Earlier this week I signed up to run the 2016 Disney Half Marathon. I signed up my daughter Amanda too as her college schedule got adjusted so this race is now the weekend before she goes back to school rather than the week after. This will be her second half Mary. I counted my history and found it will be my eighth. The last time that I did this race the result was not pretty. I was fat, I hadn't trained, and I walked the whole thing expecting to be picked up at any time by the sweep bus. I avoided that embarrassment but that was about the only one I did avoid. Now I am fatter, I still haven't trained, in worse shape but have 248 days to fix that. Today, I hunted up my Garmin, my iPod shuffle, my RoadID, put on my sneakers and hit the running trail. I walked for just over 40 minutes and 2.35 miles. One has to start somewhere. I saw this stencil spray painted on the trail. 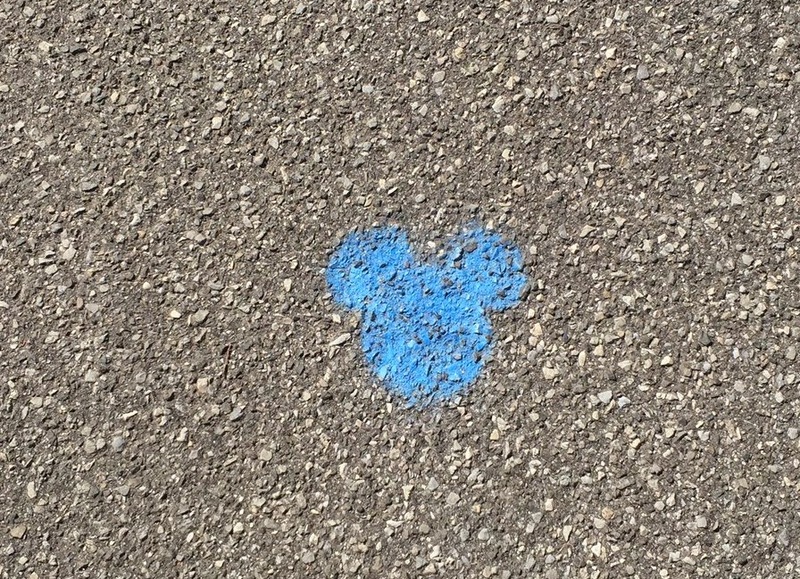 There were a bunch of them that were put there by folks training for last years flavor of Disney (I only know this because at some point someone painted "RunDisney2015"). I found it motivating. I also found it a little disappointing that someone is spray painting the trail. You can't out run a bad diet. During Ironman training I used to run a half Mary one day almost every weekend. There were a lot of old people on the trail walking and running. I want to run most of Disney, not walk. I'm now one of those old people. I need to run an official sanctioned 10k before the end of September to get a qualifying time to be with the runners rather than the walkers at Disney. Time to look at race calendars. Perhaps Cow Harbor? I haven't written a blog in a long time. Fixed!